Some micronations stride onto the world stage, squeaking mightily "BEHOLD MY GLORY!". Others, however, slip into existence, allowed to continue only because history missed them during spring-cleaning. Such a nation is Seborga, located in North-West Italy. Sold to the Kingdom of Piedmont-Sardinia in 1729, who then allegedly forgot to legally register the purchase, Seborga was left out of the agreements ratified by the 1815 Congress of Vienna, and hence, in the eyes of the Seborgans at least, left in a constitutional loop-hole, thereby allowing the statelet to still claim to be distinct from its larger, overly-gesticulating neighbour, Italy. However, while its claim to independence might only be through the oversight of 19th Century moustachioed diplomats, Seborga achieved its freedom in a most flamboyant fashion: a revolution in 1963 led by the head of the local flower-growers cooperative, Giorgio Carbone. That's right, a rebellious, left-leaning rose farmer. Like all good socialists, once victorious and voted into power by the people of Seborga, Giorgio immediately declared himself Giorgio I, Prince of Seborga. To be fair, he did put his leadership to the people again a short 28 years later, and was voted in through a referendum - winning 304 to 4. Those 4 people must really hate flower-growers. Best of all, Giorgio's title until his death in 2009 was "Sua Tremendita" or "Your Tremendousness". Me, I would have gone for "Your Most Bodaciousness". 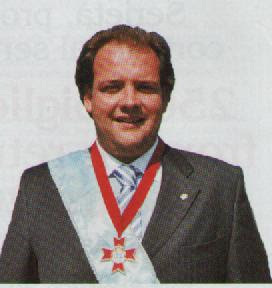 Seborga's new ruler is now Prince Mengatto I, who won a close fought election against his rival Pepi Morgia, by 89 votes to 67. Worryingly, only 156 of the 220 eligible voters turned out, suggesting that the Seborgan electorate is rapidly growing disillusioned with modern politics, or that the joke has got a bit boring by now. Prince Mengatto I: Most Awesome Medal, Dude! Seborga's relationship with Italy actually seems to be rather good (I suppose compared to the actual shadow state run by organised crime in places like Sicily, the Italians are probably not too worried about the late Giorgio's regime, no matter how tremendous). Seborga's currency is exchangable with the Euro, and the Seborgans have been allowed to establish a Seborgan Consulate in Cuneo, Piemonte. However, the residents do pay taxes to Italy, and vote in Italy's general and regional elections. Sceptical Italians have accused Seborga's independence of being a ruse to attract tourists. I find such besmirching of His Tremendousness highly upsetting.